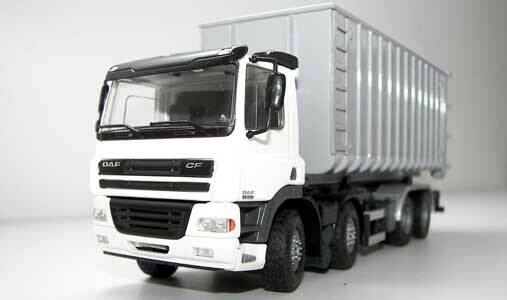 This DAF CF with VDL roll-off tpper is one of the models in the basic collection of Tekno. This model is available in white, as shown here, but also with blue, orange or red cab. 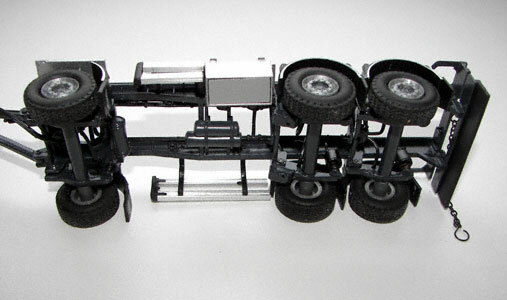 The drawbar trailer is sold separately. 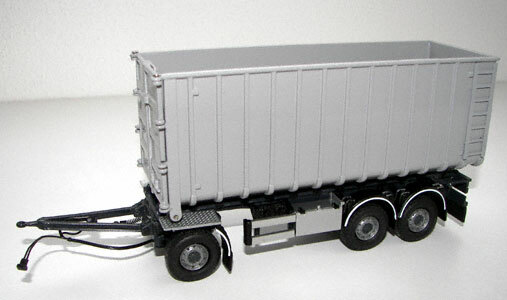 The model is based upon the universal chassis, originally introduced by Zon Models. As usual with Tekno, the model shows a high level of detail. Of course the roll-off system is fully functional. The cylinders are also strong enough to display the system in allmost all possible ways. Since the telescopic part of the roll-off system doesn't lock, the model can only limited be shown while tipping. On the system is a small knob which locks the hook, making it possible to show the model with the container slightly raised. By pushing the knob the hook can drop further. The same knob locks the roll-off system in the tipping mode. 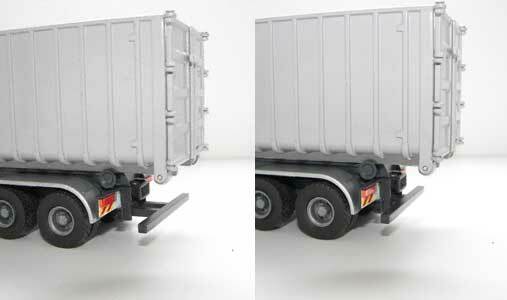 Nice detail is the rear bumper, which can be adjusted to the container length . 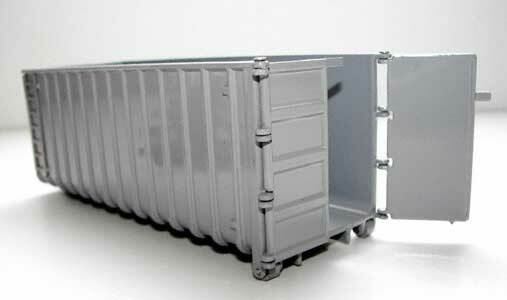 Tekno also paid lots of attention to the containers supplied with the model. The container futures opening doors, functioning rollers and access ladders on both sides at the front. 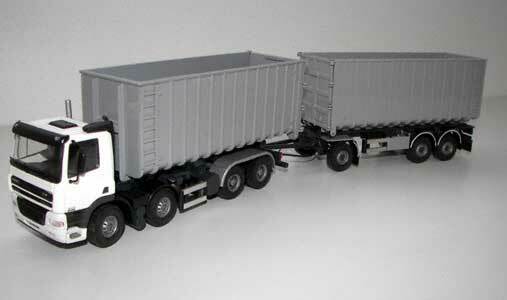 Now let's take a look at the drawbar trailer. 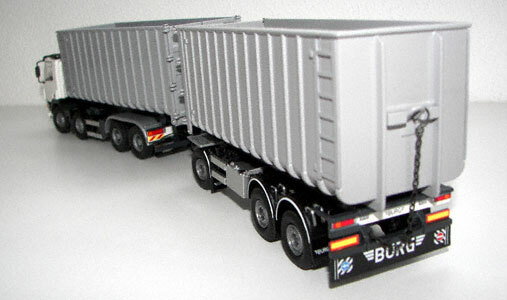 The original is build by Burg, and Tekno has done a good job scaling it down to 1/50 . This model is assembled in China. 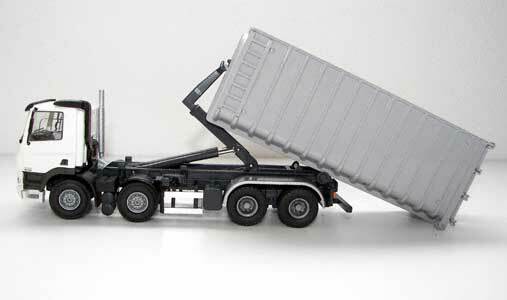 If you take a look at the trailer without load, you can immediately see the first details: painted mudguard struts and all brake lines are featured on the model. Nice detail is the drawbar, which has a spring attached to keep it on the right height. And also the bottom of the model is worth being displayed. 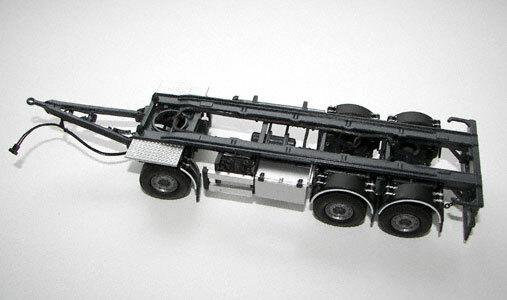 All air tanks are on the model, and all axles are sprung. The mudguards on the first and the last axle are printed with the Burg logo, and the mudguard attached to the bumper is flexible. 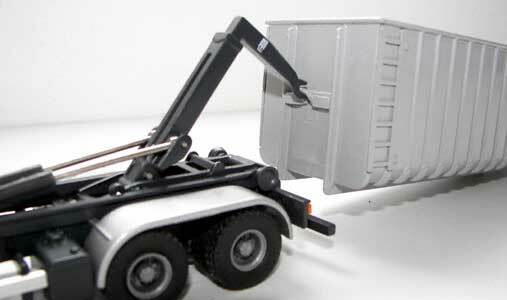 A chain is attached at the back of the trailer to secure the container. The whole combination is nicely printed. Despite being a basic model, it's absolutely an excellent addition to any truck collection.